Features: Luxurious and delicate. These pearl clip on earrings are perfect for brides. ?Of course, you can order them for pierced ears too. 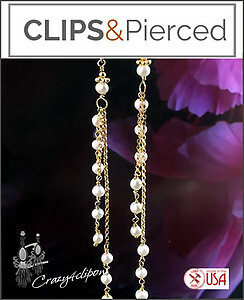 Long strands of 14K gold filled chain are complimented with gradual fresh water pearls, each uniquely hand wrapped for that exclusive design look. 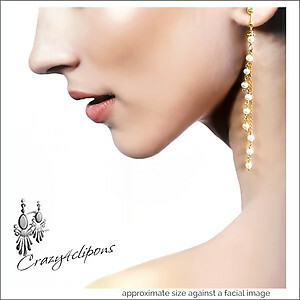 These long ?pearl earrings as so light and easy to wear. They look superb with strapless gowns. Specs: 14K gold filled chain, 14K gold filled daisies, seeds and wire. Small white fresh water pearls.